It was raining, a wet Wyoming drizzling rain that soaked both man and horse as fast as any downpour. Too wet to ride to Dogbite which meant it would be a miserable Saturday evening in the bunkhouse. There was the usual desultory poker game being played for matches going on at the main table, Dan Crow was on his bunk reading a new book he had picked up on his last visit to Bailey and Henry Lee was sitting cross-legged on his bunk darning a pair of grey socks. Crow watched him for a while then, bored with the dime novel, he wandered over and sat next to his friend. ‘You watch, betcha the sun will be shining on Monday with the weekend busted behind us,’ Lee said quietly concentrating on threading a thick darning needle. ‘I told you I’m saving my money for a rainy day. Henry Lee set down his needle, woollen tread and mushroom darner, took the makings from his shirt pocket and rolled himself a very thin quirly and fired it with a blue topped match. He did not offer the sack of Durham to Dan Crow. ‘Forget it, nothing. How much? Henry Lee was silent for a long while, his darning forgotten. Crow held his tongue, watching his old friend deliberate his uncertain future and the eventual resting place of his few dollars. An hour so later the two men their bellies filled with bacon beans and sourdough bread relaxed in the early morning sunshine. They had debated on going back to the ranch after three days of clearing out the arroyos and coulees of Slash Y beef and penning the half wild animals in a brush corral at the back of Cold Canyon. Lee wanted to stay saying they could loaf away the day and another night as they would likely not be missed. Crow was all for getting back to the comparative comfort of the bunkhouse, his joints ached from the cold and the hard riding but Lee was adamant they stay so, reluctantly, he gave up on the argument. Lee pulled his hat low over his eyes and settled his head on his saddle, it had been a cold restless night and he was ready for a doze. ‘What did he die of?’ Asked Lee, curiosity getting the better of him. ‘So, what did you do?’ Asked Lee. ‘Find who for god sakes?’ Lee said, leaning forwards. ‘Tall or short, Lee, that’s a true story and what is more it didn’t quite end there. I headed back for the entrance to Cold Canyon on the fly and there he was…’ Crow paused thinking about it, as if remembering. ‘There’s more?’ Lee asked quietly. ‘You don’t say,’ said Henry Lee. ‘Yes, I heard him.’ Crow said. ‘Whatever you say, Lee, whatever you want is ok by me.’ Crow turned away, smiling to himself and thinking there was always more than one way to skin a cat! ‘It can’t be helped, someone has to take him on,’ Crow said, a hint of despair in his tobacco stained voice. ‘Others have tried, no shame in failing here.’ Lee said. The Kid was lean, twenty years old or there abouts. Short, wiry, red headed his handsome freckled faced sported a seemingly constant grin. His real name was Aaron Meade but he didn’t answer to that, not ever. He signed on at the Rocking W for the fall roundup and stayed on after the drive, popular with most of the crew although his constant need to please became a bit wearing to the older hands. He claimed to be from Kentucky and sat a horse well. In shotgun chaps, the cross-draw pistol he wore for show, faded red shirt and black leather vest he was quite striking and attractive to the young and not so young woman of Dogbite, another thing that scratched at the hides of some of the older hands. ‘What you two old farts up to, lollygagging around here while the boys are out riding?’ Asked the Kid with a grin wider than an open barn door. ‘Special duties, Kid,’ Crow said, shifting along the rail so the newcomer could swing up between them. ‘That old pinto,’ Crow offered. ‘Even for an old fart like you?’ The Kid was smiling again, that wide innocent smile. ‘Especially for an old fart like me,’ Lee snapped back. ‘See you later, Kid, you look like you could use some shuteye.’ Lee climbed down behind Crow and nodding to the youngster and without a backward look the pair crossed the yard, went in through the front door of the cook shack, nodded to the dozing cook and exited through the back door, turned left and into the back of the barn. Crow leading the way, they climbed the loft ladder and settled down by the hay hoist to watch The Kentucky Kid. The Kid stared after the pair for a full minute before turning his attention back to the paint horse standing quietly in the corral. With just one quick final glance back over his shoulder The Kid seemed to have made up his mind and climbed easily into the corral. He unbuckled his pistol belt and hung it over the rail before taking down the blindfold from where it was wrapped around an upright then, swinging a saddle from the rail onto his lean back, he approached the paint with a high degree of caution, even a half broke animal could prove unpredictable. Then, talking to it, humming softly to himself. The animal stared at him from its right eye while the other one, the dark one, seemed to survey the landscape beyond and back of the approaching young cowboy, seeking out the two punchers settled on the hay bales, it’s flank and tail flickering now and then to disturb the gathering horse flies. The Kid slipped the blind over the paint’s head and the animal seemed to lower its head to accommodate the move. ‘You’re quieter than a lamb, old horse,’ The Kid muttered as he carefully swung the saddle onto the big animal’s back, all the time talking softly, almost a whisper, a soothing murmur, a hum and a gentle crooning sound. He tightened the cinch and reaching up to the cantle with one hand and the horn with the other gently rocked the rig to check it was set down hard. They watched from their hiding place as The Kentucky Kid swung aboard, wrapped the line around his right hand and with his left slipped the tether from the halter and then the blind from the animal’s eyes. The paint just stood there for a long moment and then gently walked away from the pole, shaking its big head. The kid touched it gently with his heels a couple of times but the animal stayed put like it was glued to the dust of the big enclosure. The Kid relaxed a fraction and as he did so, the paint seemed to sense it and exploded beneath him. It reared, it bucked, its backside going one way and its head the other, it sunfished, it went high and came down hard on all four rigid legs, it turned like a whirlwind several times in its own length, it broke into a run and stopped hard, skidding in the dust nearly unseating the startled rider. 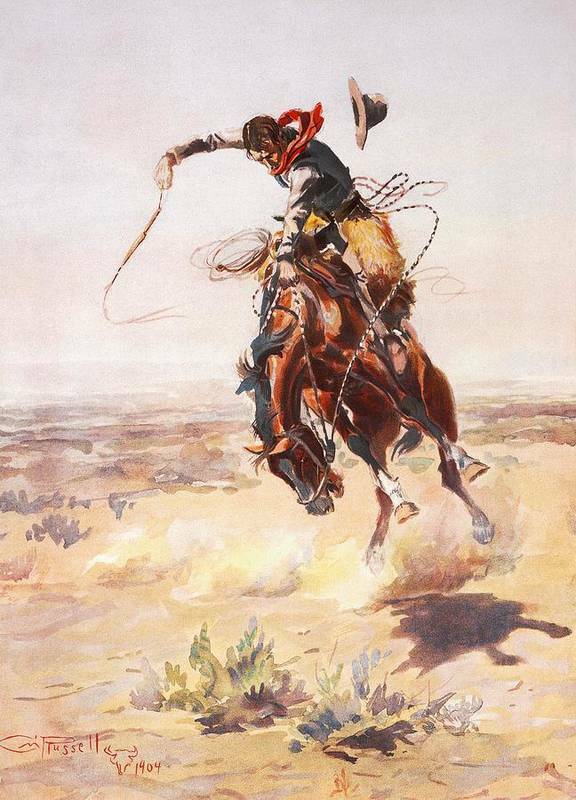 And then it did it all over again harder only this time it didn’t stop the run at the rail but jumped clean over it horse and rider disappearing in a cloud of dust The Kid yelling and waving his hat in the air like a true bronc buster. ‘Or maybe even back in Kentucky,’ said Crow with a grin. Dan Crow and Henry Lee lay side by side in identical tin baths in the back of Chow Ling’s Chinese Laundry. Every now and then Chow Ling’s boy brought in a huge jug of fresh hot water and topped up the frothy, grey-coloured soapy water in the two baths. Both men wore their hats and both were smoking damp stogies and occasionally swigging at a bottle of whiskey purchased from Halloran’s Saloon and Pool Hall. This was a regular monthly outing for the two weathered cowhands and, while they soaked in their six-bit baths, Chow Ling washed and dried their range clothes while his son, apart from toting water, waxed and polished their worn boots. It was a ritual both men enjoyed. ‘Only because I get it cut regular and don’t try to go around looking like some out of place Buffalo Bill.’ Crow responded, conscious that his hair was a lot thinner than he would have wished it to be. He lifted one foot out of the murky water and trimmed at a split toenail with his pocket knife. Crow splashed his foot back into the bath and said nothing. Crow did not respond, other than to toss his stogie into the bath and reach out to where the towels were heaped and retrieve a replacement, lighting it with the candle provided and sinking a little lower into the hot water. ‘Come on, Crow, you can tell me. You shoot it off when practicing that quick draw you brag on? Rattler get it? A bear, maybe?’ There was laughter in his deep voice. ‘Without it you mean,’ Lee chuckled. Crow sighed long and hard, reached for the bottle and drew on that long and hard, waiting for an inevitable tall tale from the usually taciturn Henry Lee. ‘You was born with four toes, so what else is possible? Willy James, no relation to Jesse of course but from around Missouri way nevertheless, he was born with green eyes that never closed. Green eyes with yellow rings around them, never closed them, slept with them wide open, rolled up into the top of his head. Gave me a hell of a fright first time I saw him asleep. Went to wake him for night hawking, thought he was a dead man for certain. Someone once told me the devil never sleeps for fear of God finding him and Willy sure enough looked like the Devil to me.’ Lee shuddered. Chow Ling’s boy came in with the last jug of hot water and Lee took off his battered Stetson, swished some soapy water over his long hair and indicated to the boy to pour. Wiping the soapy water from his eyes, Lee shook his head like a dog shakes after a swim and put his hat back on. The boy then moved across to Crow who took off his hat and awaited the drenching. Chow Ling’s son poured the water, and Crow cursed the fact that he had left his cigar in his mouth. The boy bowed and left the two men to their ramblings. ‘How come?’ asked Lee, irritated. ‘Because I got six toes on the other foot, you old fart. I got ten same as you, it’s just that mine are a mite badly organised,’ Crow said, with a chortle, finishing off the whiskey and lighting up the last stogie. Christmas could be a sad time for the working cowhand, many of them young, transient workers without a real home other than a bunkhouse. It can be an even tougher time for the older, long-time hands who have little to celebrate and little to look forward to other than a couple of days off, a bottle or two from The Boss and, if they were lucky, the foreman as well. Those and a jug or two of forty-rod stashed away for the occasion helped to lighten the load of a heavy few days. A bottleful of memories is no replacement for a loving family and yet bunkhouse buddies are in many ways a family in their own right. While they no longer believe in a Santa Claus who was long ‘Gone to Texas’ and faraway it was still Christmas. Very few gifts exchanged but an effort is always made to ease the melancholy. Cookie makes a big show, a couple of wild turkeys with all of the fixings, a mountainous apple pie and whisky to round off a Christmas day feast. The evening that followed usually ended late in a tobacco smoke-filled room with a mournful sing-song to a lone guitar or mouthorgan around the red hot, pot-bellied stove. Such is the cowhand’s lot but, one thing is certain, there has to be a Christmas tree. While the festivities were limited that was a sure enough certainty, there had to be a tree and somebody had to ride ‘The Christmas Tree Run’ and take the small buckboard up to the high ground beyond the Rocking W’s meadowed valley to the pine trees that grew along the north ridge just about where the good winter grass ended and the rocky escarpment began. Those somebodies happened to be Dan Crow and Henry Lee, neither man too happy at the prospect of a sore backside and a long cold ride on a buckboard to the high country with a promise of early snow in the wintery sky. Their combined protest of ‘we did it last year, Jake,’ to J.C. Cobb, the Rocking W’s ramrod, fell on deaf ears. Two days before Christmas and, apart from a couple of snoring early-nighters, the bunkhouse was deserted. Lee was mending the eternal hole in one of his once-white socks and Dan Crow was reading Ben Hur wondering why the hell there were no lawmen or cowboys in it when it was written by the man who really brought about the downfall of Billy the Kid. Was it allegorical, he wondered? He thought of mentioning to it Lee who claimed to own Billy’s pistol, but thought better of it. He dogged the corner of the page, stretched and wandered over to table where Lee was trying to thread a darning needle for the tenth time. Crow tossed the makings onto the table and the pair rolled themselves cigarettes in silence, each thinking the same thing; was there a way out of the cold early morning’s Christmas tree run? ‘You need some eye-glasses,’ Crow said, quietly blowing smoke rings into the warm air. ‘What we both need is a way out of that long, cold ride up the hill to get a damned tree we could have cut before the cold set in.’ Lee said. ‘We could try The Kentucky Kid again,’ Crow said, wistfully looking over to where the sleeping Kid was gently snoring into his striped pillow. ‘He should have thanked us.’ Crow said. ‘He came back with that outlaw pinto real lady broke and gentled. The Boss was tickled pink, invited him up to the house for supper, and his sister has a soft spot for him now, I seen them riding out and they looked good together,’ said Crow, wistfully. It was a long hard ride to the foothills and the shaggy coated pulling horse was in no mood to hurry. It was late afternoon before they reached the first stand of pines, selected and felled one, gathered a couple of gunny sacks full of cones for the bunkhouse stove, drank some cold bottled coffee, ate their paper wrapped corn dodgers and set off back down the hill. They had not been on the move for more than five minutes before the sky suddenly darkened to an ominous, slate grey and the southerly wind changed direction for no reason at all as far as Crow could figure, and began blowing the first of the winter’s northern snowflakes hard at their backs. Within moments their range of vision was cut from miles to a few yards, decreased with every step and the temperature dropped sharply. Finally, bitterly cold and tired of fighting the blizzard, they gave up and pulled the small buckboard into the lee of a large rock and unhitched and hobbled the shaggy pony. ‘We have to get a fire going before we freeze to death.’ Crow said, pulling his scarf tighter over his hat and forcing the crumpled brim down to give his ears some protection. Around midnight the whining north wind dropped as suddenly as it had come and a warmer, fresh southerly quickly blew away much of the drifting snow, clearing much of the downhill trail. A little before dawn, Dan Crow and Henry Lee rode the hardy pulling horse into the yard of the Rocking W, the pair clinging to each other for warmth. The cook banged the triangle and within minutes the two men were helped from the tough little animal’s back and half dragged into the warm bunkhouse. They shivered and their teeth rattled but they had no frostbite and warmed through quickly with the help of a shot or two from the cook’s brandy bottle. ‘That tough little horse okay?’ Asked Crow. ‘In better shape than the pair of you,’ said the ramrod, with some concern in his usually brusk tone. ‘You already have a tree up at the ranch house?’ Said Crow. Lee stared at Crow and Dan Crow stared long and hard right back at him saying, ‘merry goddamned Christmas, Henry Lee.’ It was all he could think of to say. “What did he die of.”?“He died of disappointment “ Now there’s a line of conversation between two old cowboys who ,though they have spent an age together still have stories to surprise each other with. The author has built a friendship and bond between these weathered aging men .Their lives continue to play out within this framework of ranch,chores ,riding and memories . Tales that are a joy to read. Thanks for your comments, glad you enjoyed it. One of my favourites. Read a few of these to my boys at bedtime. Had to edit the curse words out. Tried to stop reading out loud when I thought they were sleeping only to have them both say “mommy, read more! !” Thank you for these. I know the song but my boys can grow up to be cowboys if they want to. These stories give them something to dream about. Glad you and your boys enjoy them.